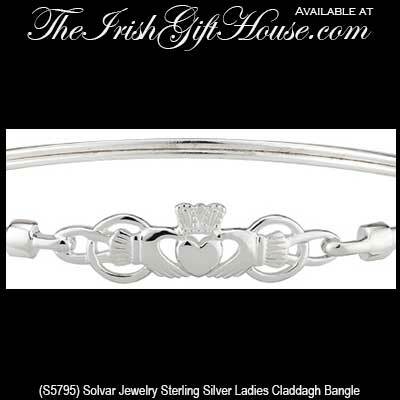 This sterling silver Claddagh bracelet is a bangle style. This Claddagh bracelet is a bangle that is crafted in sterling silver and features a hook style closure. The Claddagh bangle measures 3/8" tall with a 2 1/2" wide oval when closed and is suitable for most women's wrists. 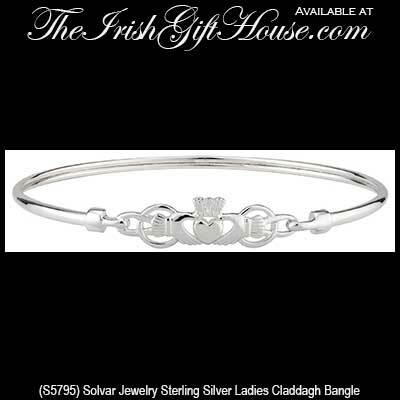 The Irish bangle bracelet is made in Dublin, Ireland by Solvar Jewelry. and it is gift boxed with the Galway Folklore along with a Claddagh history card that is complements of The Irish Gift House.